In this eighth year of One Book One Nebraska, Nebraska libraries and other literary and cultural organizations continue to plan activities and events to encourage all Nebraskans to read and discuss the same book. Join us to hear more about this statewide reading promotion activity, sponsored by the Nebraska Library Commission and the Nebraska Center for the Book. 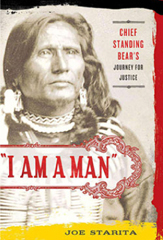 Joe Starita, author of the 2012 selection will be with us to discuss his work, I Am a Man: Chief Standing Bear's Journey for Justice. For more information, to register for upcoming NCompass Live events, or to listen to recordings of past events, go to the NCompass Live Webpage. Apply for Nebraska Library Commission C.E. Credits - Report your C.E. Activity - You must include your name and your library name. We will assume you watched this recording on the date of the email, unless you tell us otherwise. Please feel free to include any comments about the session as well. Check the C.E Guidelines for information on earning C.E Credits. Please email Laura Johnson, Continuing Education Coordinator, with questions about C.E. Credits.